Government’s Khomanani programme and other campaigns, like Lovelife and the TV drama, Soul City, are successfully helping to make people more aware of HIV and AIDS, how to prevent it and how to live with it. This was found by a study done jointly by Health and Development Africa, the Centre for AIDS Research and Development, Soul City, and the American Johns Hopkins Health and Education company in South Africa. 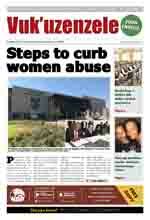 The study was funded by the National Department of Health and the United States Agency for International Development. 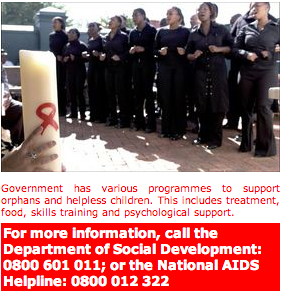 The aim of the study was to find out whether the different Aids communication programmes were working in South Africa. The study showed that there was an increase in the use of condoms, discussions about HIV testing between sexual partners, discussions about HIV between friends, knowledge of antiretroviral treatment for AIDS, and being faithful to partners to prevent HIV infection. It was found that the 19 AIDS programmes reached a total of 92,5 per cent of the adult population, which is about 27 million people. This means that there are some 2,2 million adults who are still not reached by the programmes. The study also shows that television, through the TV drama Soul City, reaches the most people, followed by national radio programmes, community radio and local community events. People between the ages of 25 and 34 are twice as likely to discuss HIV testing than those in the age group of 35 to 65. Young women are more likely to get tested than men. Those who know someone who has died of AIDS are more likely to have been tested in the last 12 months. The study recommended that new strategies were needed to reach the 2 million adults that are still not being reached by the Aids communication programmes. Government will protect these children while supervised by adults in communities. To help government protect them, the department is getting together a national list of orphans and helpless children, including those heading families. Government also has various programmes to support such children. This includes treatment, food, skills training and psychological or social support. It also helps these children to get access to social grants, free education and health care, and urgent help in cases of child abuse and neglect. In 2006, a total of 206 889 helpless children were found and helped through the OVC programme. About 357 000 families benefited, and 35 000 child-headed families were supported. In addition, the department started multi-purpose or drop-in centres where children heading families can get meals and lunch boxes before going to school. Some 1 700 organisations are also working with orphans and helpless children through the home community-based care programmes.